Welcome to Baby Week! All week long, we’re celebrating Baby Dekker #2 with fun baby-related posts and giveaways. 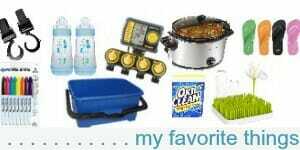 Click here to view the 12 fabulous giveaways — all geared to make life with a new baby a little simpler, more organized, and more fun! 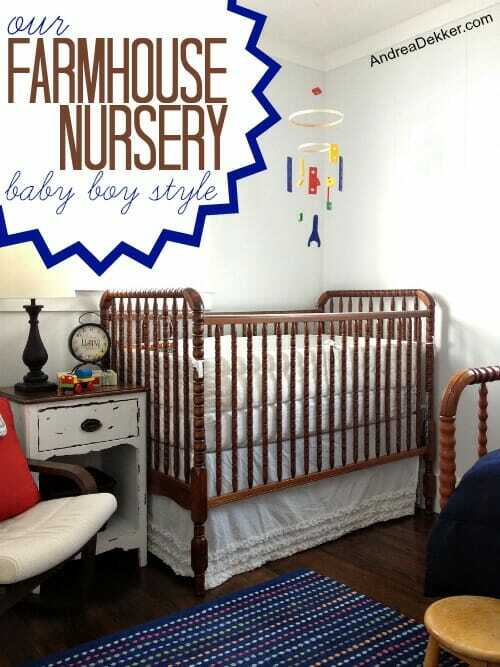 That’s right friends, it’s time for another Farmhouse Nursery Tour — baby boy style! 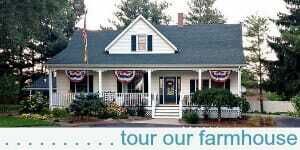 READY FOR THE FULL TOUR? 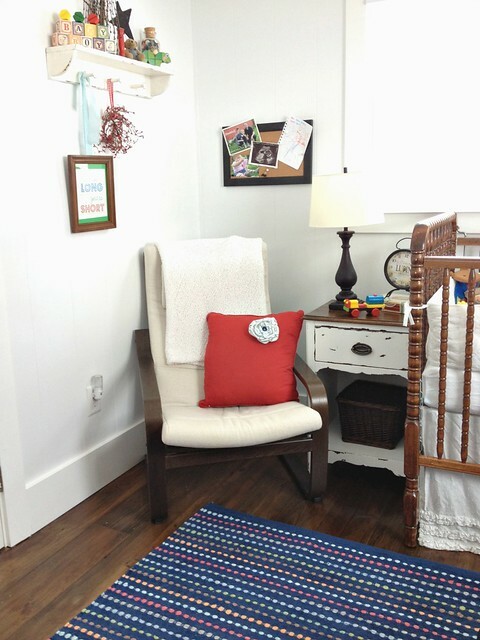 This is the view walking into the nursery from the hallway. 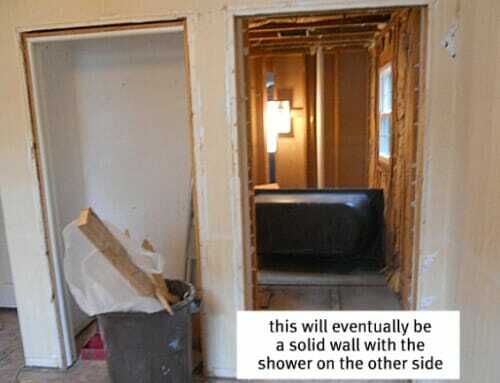 The twin bed and changing table are butted up to this first wall. We decided that since I basically slept on the floor in Nora’s nursery for the first 3 months of her life, that a twin bed would be a welcome addition to this room. 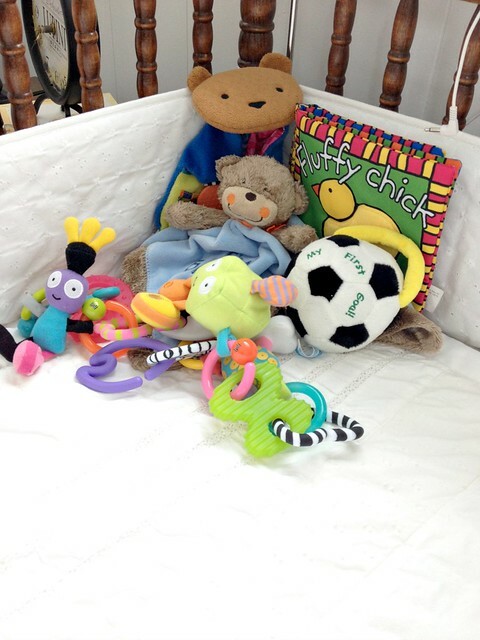 We already had the bed and all the bedding — and although it does make this tiny room a bit crowded, we’d rather be “safe than sorry” this time around! 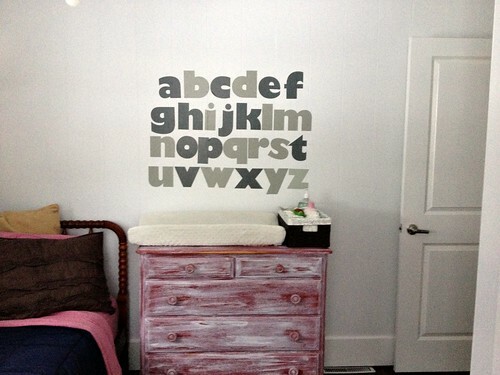 Don’t you just LOVE LOVE LOVE the huge alphabet decals we got to decorate this wall!! If you keep spinning around, you’ll see my Jenny Lind crib in the far corner of the room. 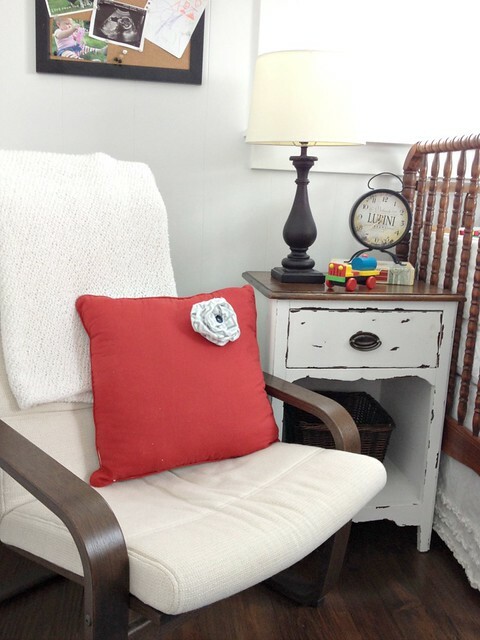 Next to the crib is a small night stand and our “rocking” chair. 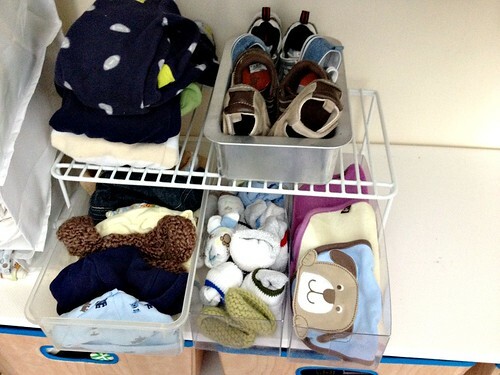 A hanging shoe organizer — perfect for all those tiny onesies, sleepers, sleep-sacks, etc. Socks, bibs, hats, slippers, and shoes in various containers I found around the house. 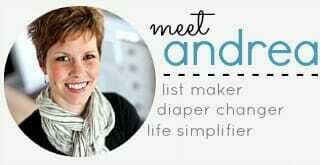 Bins of baby-wearing devices, baby toiletries, extra supplies, and baby blankets. 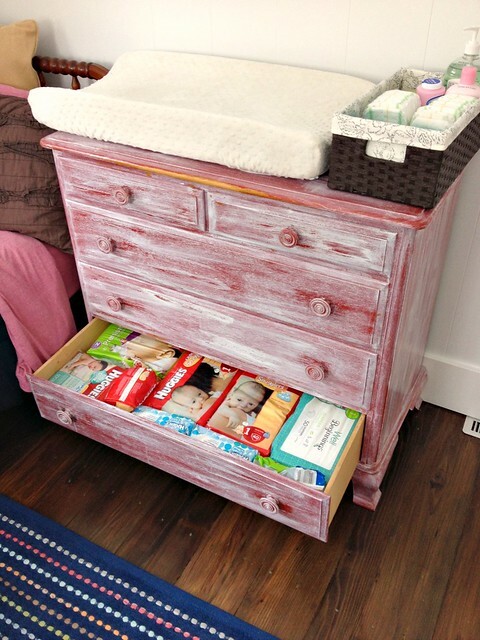 Believe it or not, the dresser is completely empty besides some diapers and a few 6-9 month items — I love it! Just for the fun of it, here is a progression of “before”, “during”, and “after” photos of this side of the nursery! 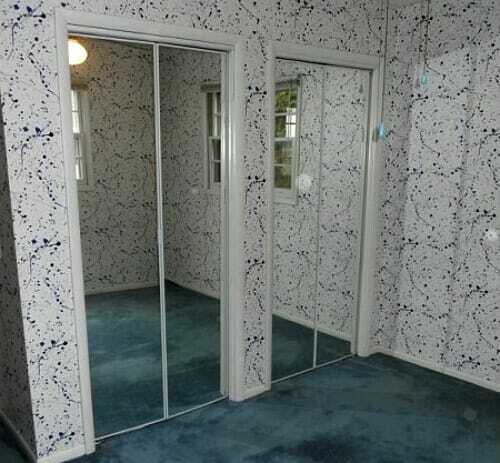 So yes, we’ve come A LONG way with this room! 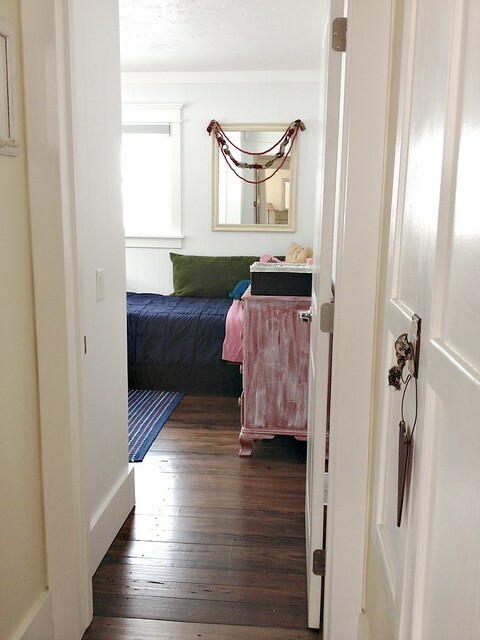 It’s SO fun for me to look back and see the transformation — and honestly, I can’t believe how much MORE I love this room now than when we originally renovated it for Nora. 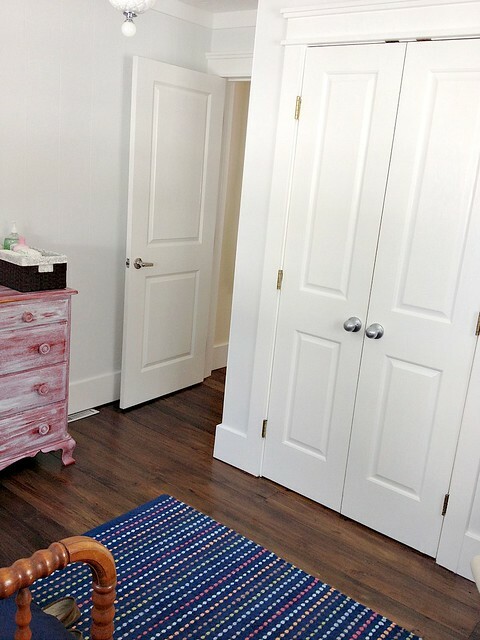 Paint $25 :: we went with Frost from Behr (the same color in Nora’s room) and we LOVE how it brightened things up! 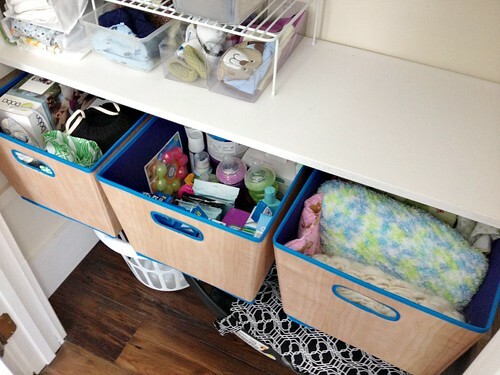 Crib, dresser, and night stand $0 :: various Craigslist purchases over the years (we used them all with Nora too). Twin bed $0 :: from Craigslist several years ago. We pulled it from a guest bedroom when we moved Nora upstairs. Twin bedding $0 :: all stuff I already had from when Nora was in a twin bed. Chair $0 :: IKEA Poäng chair that we already had from Nora’s nursery days. Pillow on chair $0 :: an extra pillow that came with Nora’s bedding. I just sewed the flower on using extra fabric I had. Mobile $3 :: Made that out of an extra toy that was sitting unused. Closet Organizers $15 :: I got the hanging shoe organizer from Amazon.com and the 3 baskets from Target (using a gift card). Rug $0 :: On clearance from Target with a Christmas gift card! 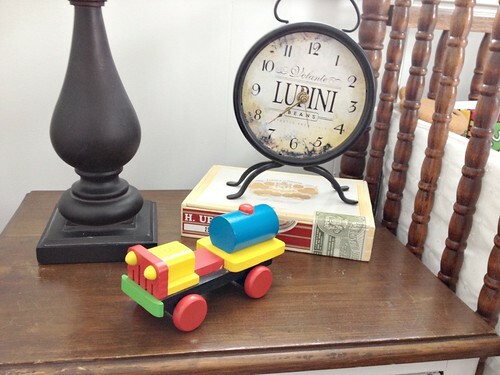 Various toys and decorations $0 :: all things we just had around the house and matched the color scheme. All together I spent about $45 on this nursery transformation. 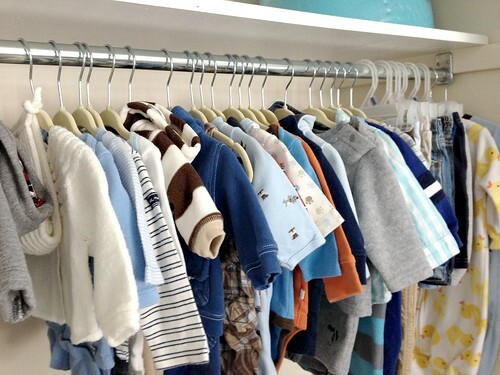 You can read more about the cost breakdown of the clothing and other baby supplies in this post if you’re interested. 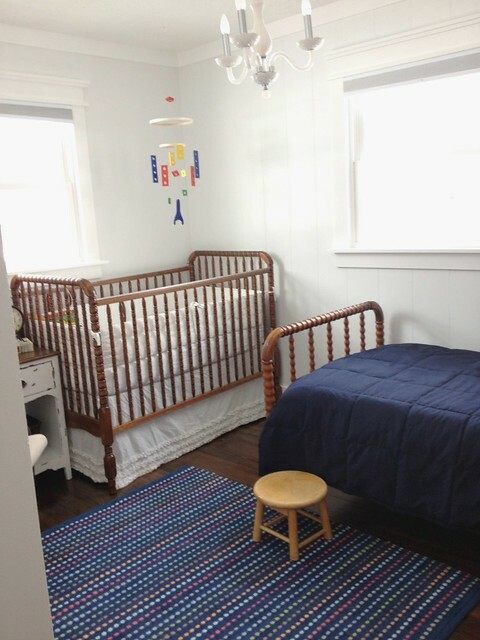 I just love how everything came together and how we were able to reuse almost EVERYTHING from Nora’s nursery but still make it look more “boyish” with a few simple tweaks. I personally think it looks and feels like a child’s room — but still with the over-all “old farmhouse charm” that I just can’t get enough of! 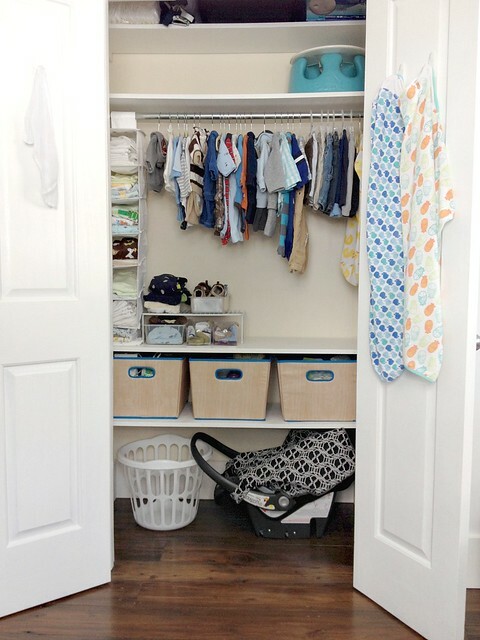 My bags are packed, so all I need to do is put the carseat in the car… and then I think we’re officially ready for this little boy! 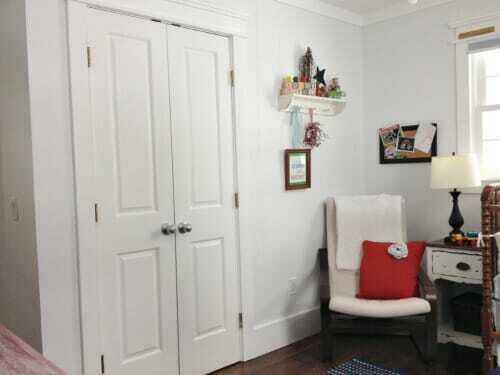 I love your style and this room came together beautifully. So excited for your new blessing!!! Hope everything goes well with baby boy! 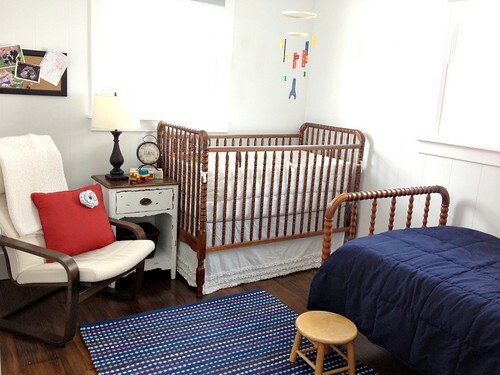 The Baby Boy Nursery looks great and absolutely ready to go! Go luck to you over the next few weeks! I will anxiously await the arrival of your special little guy! Best wishes for a speedy and safe delivery! 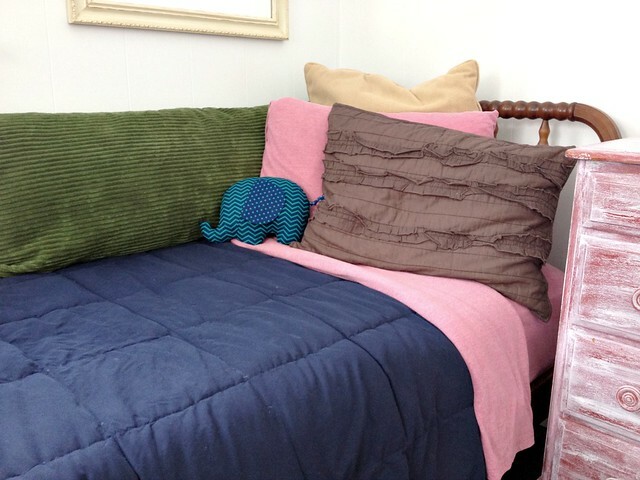 I have a twin bed in our babies’ room as well. Of course, we haven’t put the crib up yet because it’s snowed in the barn where it is being stored. What a winter for that to happen! I still have another 5 weeks to get it set up, right? Right. 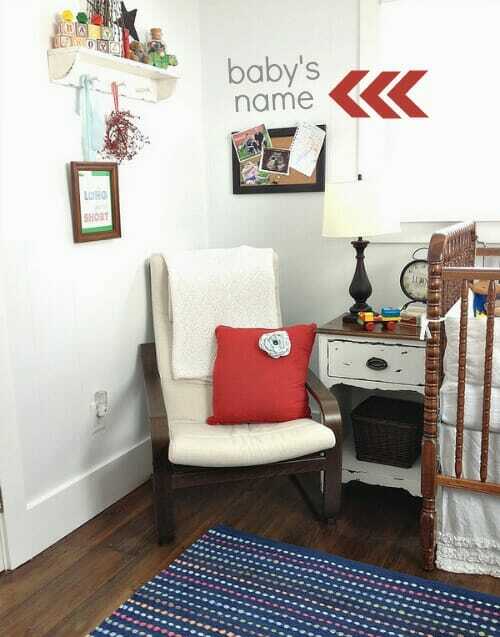 Very cute baby room, Andrea. You did a great job! super cute! you are so creative! 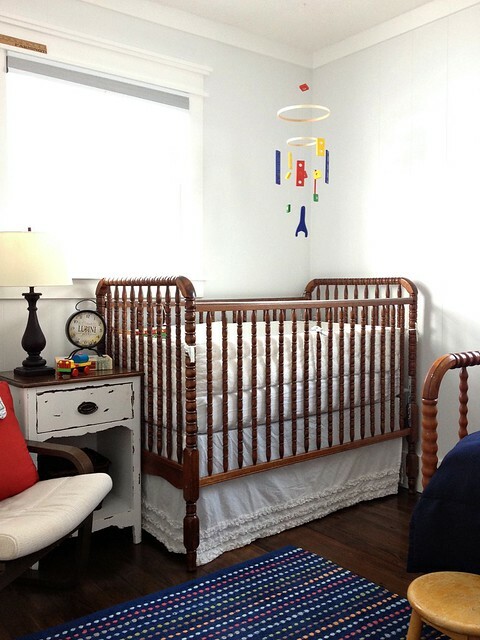 I was glad to see another nursery with a twin bed! 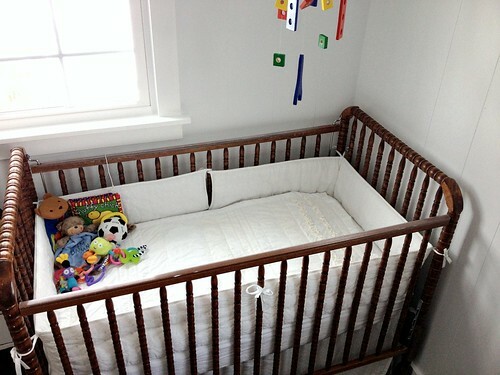 We have had a tough time selling our two bedroom house, so we have a crib and a twin in one room for the two boys. It’s surprisingly turned out better than I had thought! I’m sure you will all use it at some point in time, especially those first weeks when the baby can’t . Stop. Eating. 🙂 hoping The Lord blesses you with a safe delivery and healthy baby! Awwwwww! I love it! So simple, yet so so cute! 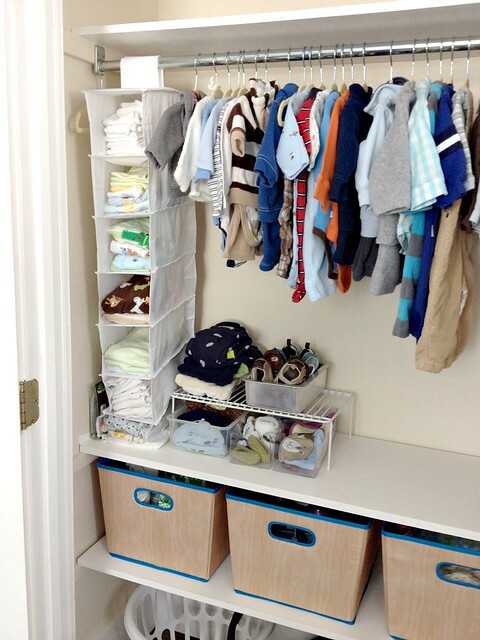 Plus, all those tiny baby things totally give me the urge to have another baby (we’re not). lol I can’t wait to see pics of the new little one. I’m sure he’ll be just as adorable as Nora! haha — the tiny baby things are REALLY cute. I never thought boy things would be so cute, but they are! Wonderful room! 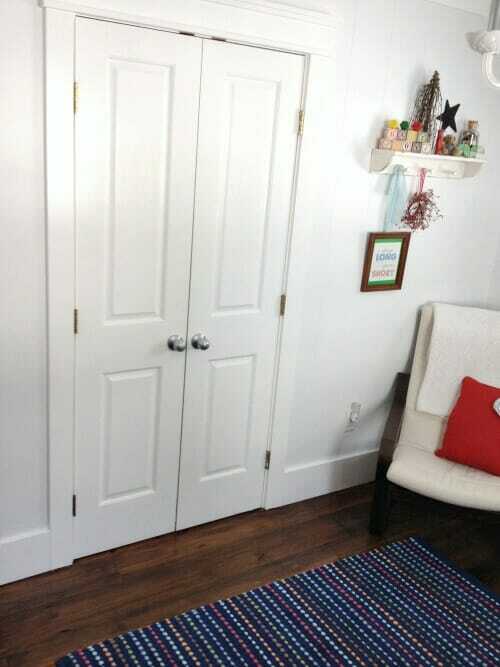 I continue to LOVE the narrow French doors on the closet, Love the new rug (sorry to hear it was on clearance…), and Love the poster your made with the Days are Long, but the Years are Short, and all the little touches. This baby is blessed to be coming to a loving family, and your love shows through the preparations. Thanks Linda — yes, the rug was a total SCORE at Target because I got it for only $18 — and most of the other rugs I was looking at were closer to $100! Looks great Andrea!! The twin bed looks fine and I think you will happier with it in there. My first had sleeping habits very similar to Nora. My second is totally different. After about 6-8 months she wants nothing to do with us at night. 🙂 The room has to be completely dark and the door closed. We were a little lost for awhile as it wasn’t something we were used too. My baby’s only 3 1/2 months old, but seeing this is making me itchy for another new baby! That’s so cute! How exciting! 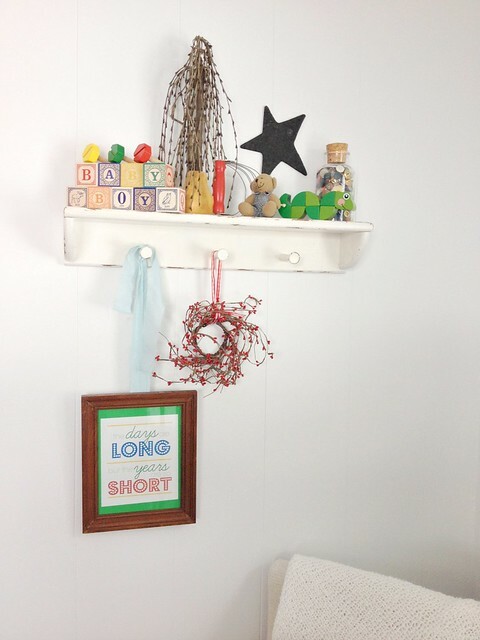 I had my third daughter 4 months ago I loved decorating her nursery. She’s still in our room since we are on a different floor. I wish we had bought a home without stairs now! Looks great! The twin bed is a great idea, although, I’m hoping you won’t end up needing to use it very much!